I planted “Clemson Spineless” again this year but moved it to a “trial” spot against the back fence since there is a pond in the spot I used last year. The okra seed goes straight into the ground, in good old fashioned dirt, vs into the fluffy soil mix of the raised beds. Does it mind? Apparently not. The soil is pretty good all things considered; it is a clay base with about 30 years of leaves and other organic matter composted into it. Also, the drainage against the back fence is pretty good since the ground level drops off behind the fence, really just sort of a raised bed itself. I ignore the seed packet spacing recommendations (ie plant all the seeds an inch apart, then thin to 2 feet so you buy more seeds next time too) and plant a couple of rows a foot apart with maybe 6-8″ spacing between pants by the time all it said and done. 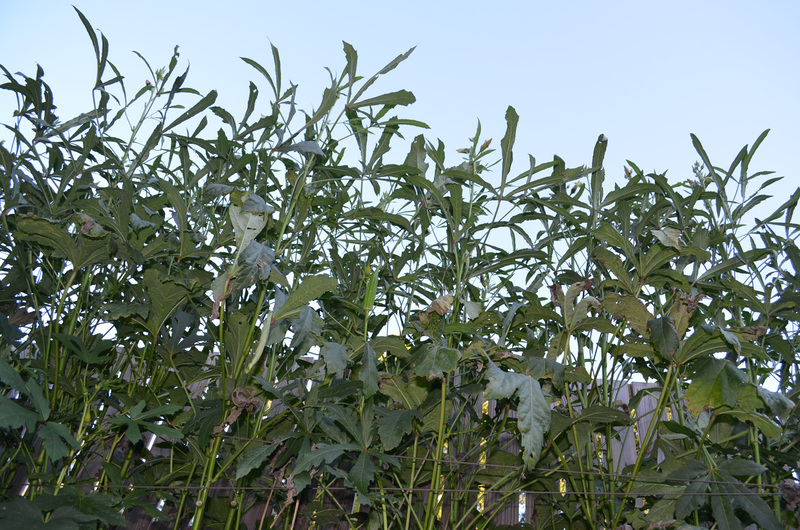 Okra is quite “competitive” and tolerates a crowd well without disease and diminished production imho. The plants are now closing in on 10′ and have started putting out side shoots with new blooms & pods; by now we are well practiced in the art of walking the top of a tall plant down to 6′ or so with one hand and snipping/catching a pod with the other.